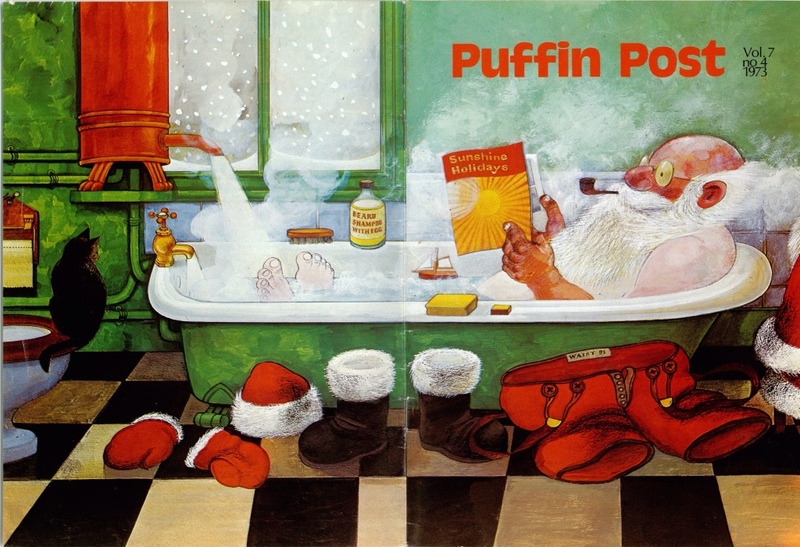 Raymond Briggs was good friends with the legendary Puffin Books editor Kaye Webb. Despite his reputation for being more grumpy than Father Christmas he found himself sucked into Kaye’s world of Puffin Club outings and general merriment. 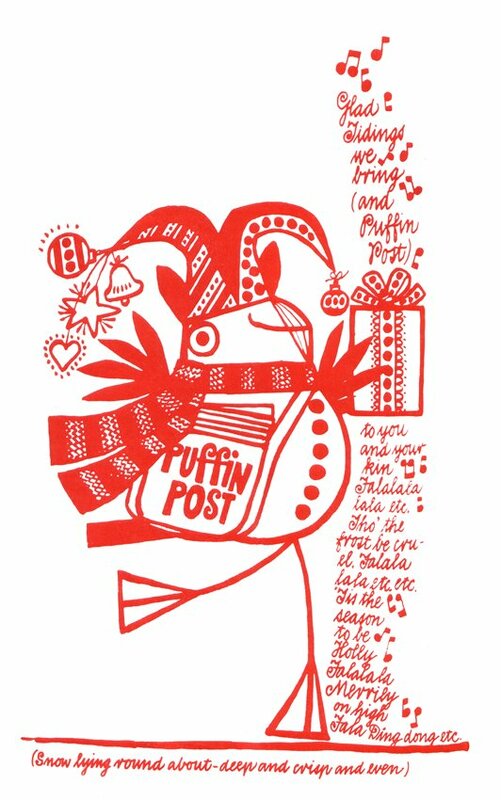 Kaye was a force of nature, and used her special skills of persuasion on many authors to obtain contributions for Puffin Post magazine. 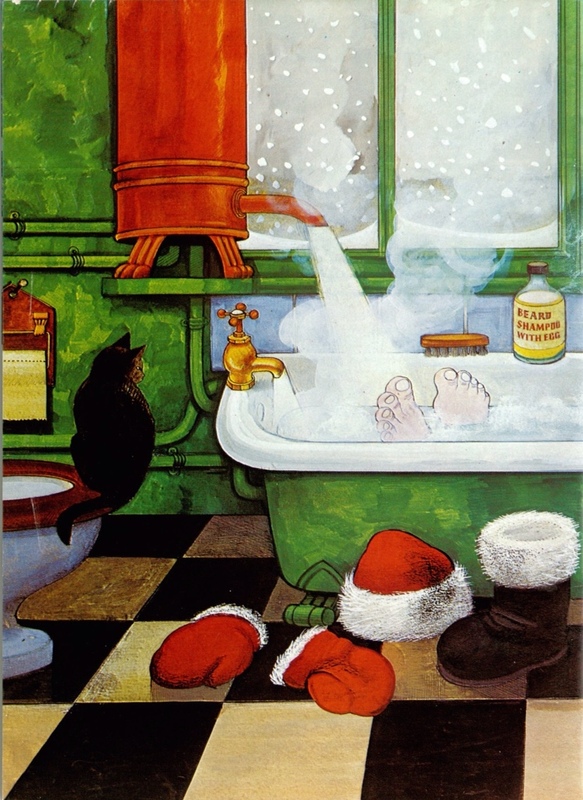 Raymond Briggs came into her sights on a visit to his Sussex home around the time of the publication of Father Christmas. 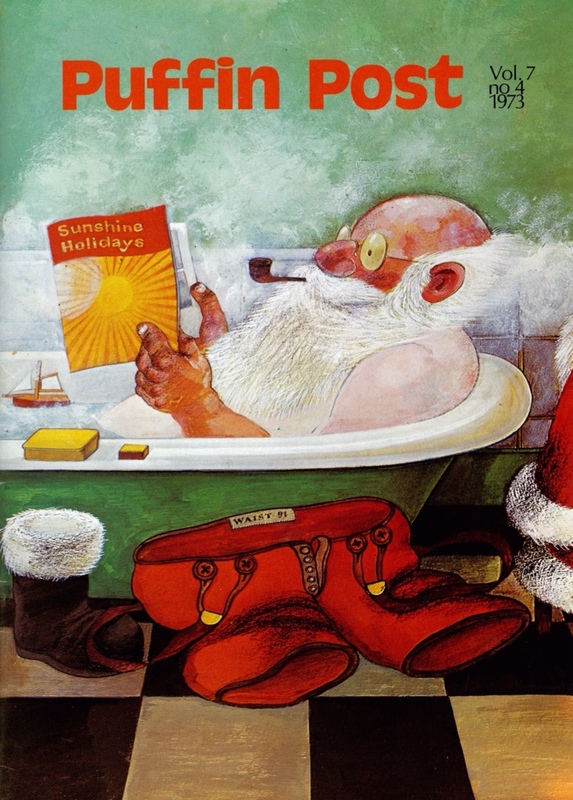 On his desk she spotted one particularly special acquisition, a painting of Father Christmas relaxing in the bath with a travel brochure. 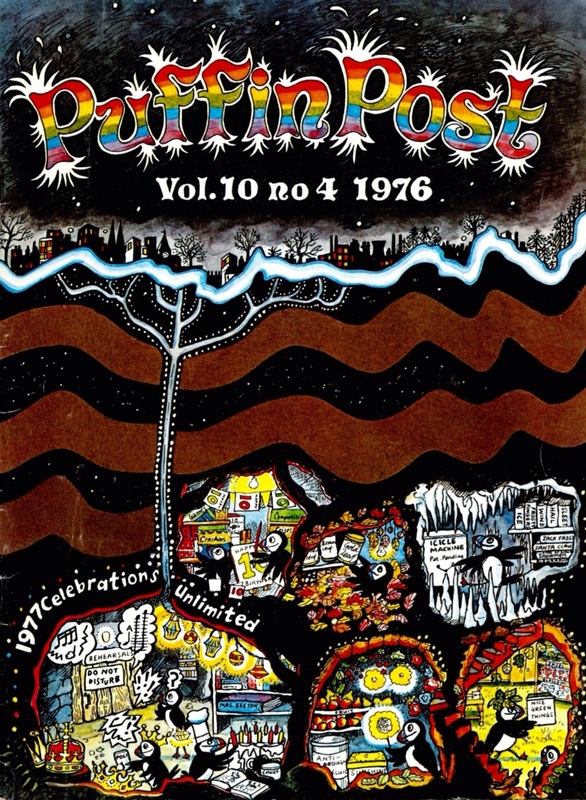 He explained that Hamish Hamilton had rejected the image for the cover of the book, and Kaye immediately seized it and put it in the winter edition of Puffin Post. 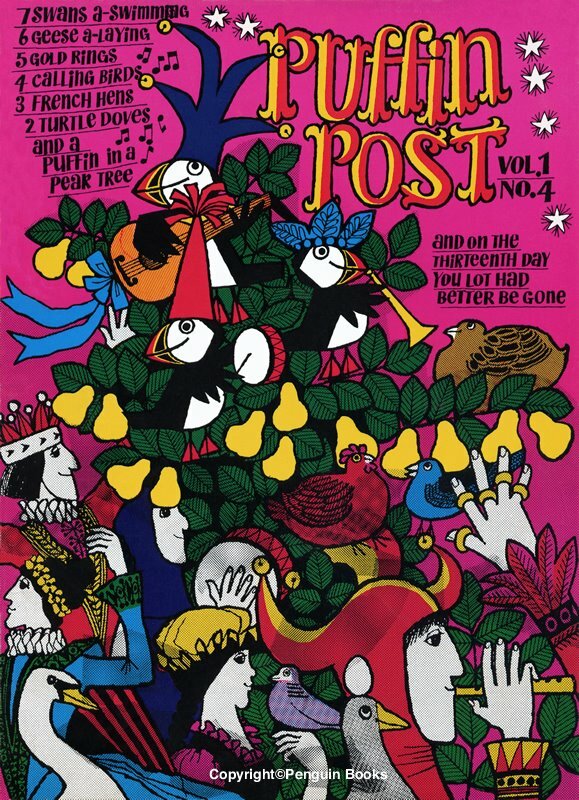 Puffin Post was a quarterly magazine for subscribers of the Puffin Club, Kaye’s groundbreaking enterprise that brought readers and writers of children’s books together. 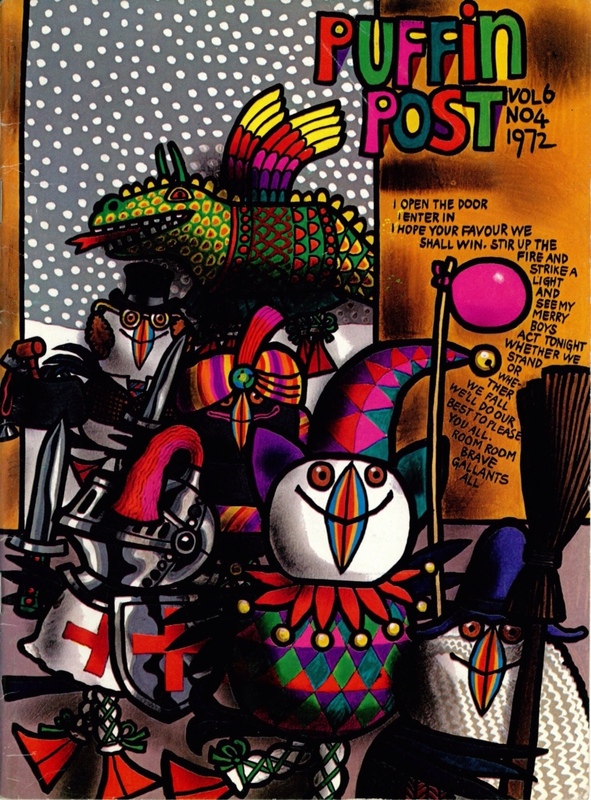 The fourth magazine of each year didn’t quite fall in December, but Kaye ‘loved the paraphernalia of Christmas’ and commissioned some extremely memorable festive illustrations for the magazine. Jill was as vital as Kaye to the whole enterprise, her illustrations inside and out providing the magazine with a quite unique personality. 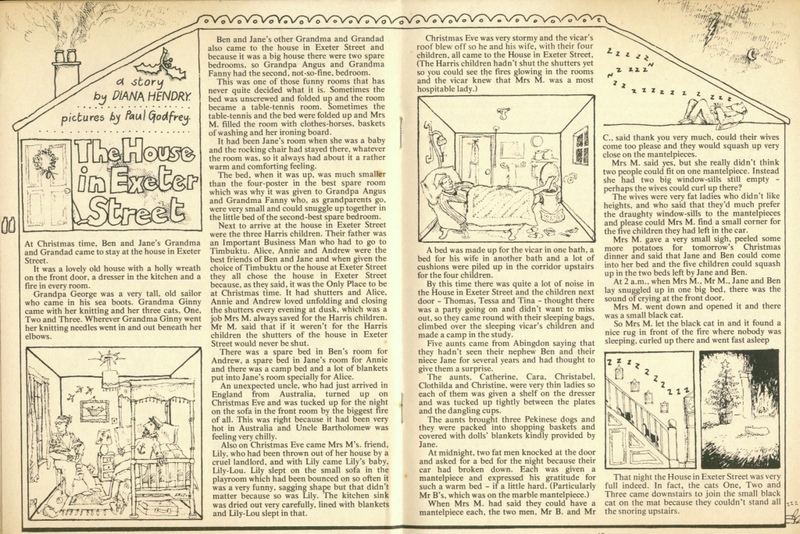 The winter issues would often feature a specially commissioned Christmas tale. Pictured here is Diana Hendry and Bob ‘Henry’s Cat’ Godfrey’s House on Exeter Street, a comic riposte to the idea of there being ‘no room at the inn.’ The story was reworked in 1989 as a full picture book, which you can read about here. Puffin also ran a series of beautifully produced annuals in the mid 70s, which allowed Jill McDonald’s imagination to really take flight. 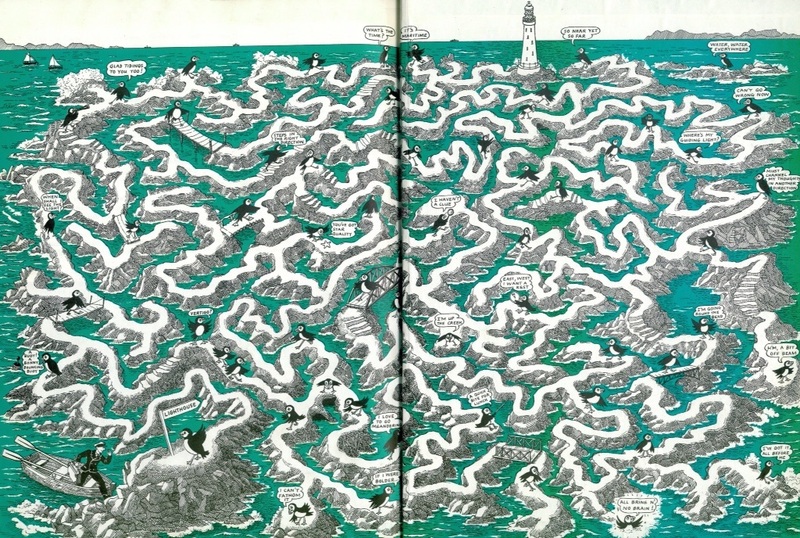 I’ll leave you with one of her spectacular mazes from the 1976 annual. Until next time, spotera! You can read more on the Puffin Club in a piece I wrote for Middle Grade Strikes Back earlier in the year: Kaye’s World: Puffin Club Forever. Thanks to the Puffin Club Archive for the additional images. Quotes from Valerie Grove’s biography of Kaye Webb, So Much to Tell. Tags: Bob Godfrey, Jill McDonald, kaye webb, Puffin Club, Puffin Post, Raymond Briggs. Bookmark the permalink. The Puffin Club and Puffin Annuals were the best – I think one particular Puffin annual (a pink cover) was the best present I had that year! I wish I still had my Puffin Club badge.